This entry was posted on January 31, 2018 by Zoe Thomas. It's unrealistic to imagine we can all love our jobs all of the time, but certain working environments make it easier - and some, unfortunately, can make it a lot harder. We're humans, not robots, and even the brightest individuals among us are prone to distraction and occasional procrastination. Poor office environments ignore the reality of what it is to be human. They are stuffy, badly lit, overcrowded, thoughtlessly designed and cheap. People are crowded in together and expected to stay seated between set hours. Typically in these places there is a culture of presenteeism: a silent competition of who can stay the latest, work through the most lunch beaks, take the least holiday. Employers who fail to understand productivity end up with staff who look like they're working - after all they're present, they can be watched and checked - but how productive are they really? How happy are they? How healthy? How dedicated? How many bright, enthusiastic, ambitious employees have been held back by poor office environments? The most successful businesses - the ones that attract and keep the most talented individuals, adapt working environments to the people who use them. Bright people need bright employers: leaders who are willing to trust them and give them space to shine. Otherwise they naturally lose enthusiasm, they lose sight of their ambitions, they feel restricted, undervalued and misunderstood. Or (sensibly, but to the detriment of the employer), they look for work elsewhere. The term agile working was originally coined to describe a more efficient method of developing software. Instead of fulfilling a brief by a set deadline (as is typical), developers split the project up into incremental sets of work. The idea is that any changes requested by the clients can then be made throughout the entire development process instead of right at the end. In other words: fail fast and learn. Agile working can be applied to all industries and all types of project - not just software development. The underlying principle is that agility prepares businesses for change, something that is a constant in our fast-paced digital world. If there's room to move, there's more chance of survival when the landscape around us begins to shift. Creating a working environment that encourages flexibility, freedom and stimulation is the key to attracting and keeping the right people. A recent study by BPS World found that out of 1,250 senior decision makers, 67% said productivity had improved with agile working. Simon Conington, MD of BPS World, said: "We found that agile working benefits employers in some unexpected ways. 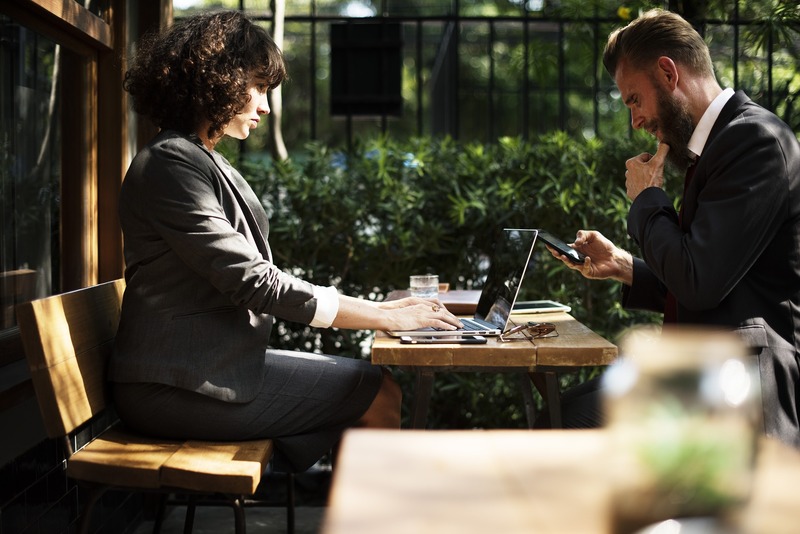 Many employees regard agile working as a very attractive option and any organisation offering it is likely to find it much easier to bring on board the skills and talent they need." - were happier at work. Agile organisations recognise talent and hold onto it, even if that means changing a person's role, or being more flexible about how and when that person can work. Traditional office rules are not always conducive to productivity. If you hire bright people and you want to nurture their skills and talent, you need to give them space to breathe. What is very important to understand is that agile working has to be a fundamental shift at the very core of an organisation. It changes everything. Are companies embracing agile working? According to research by Mitie, more than 70% of UK offices will be agile workplaces by 2020. Already many of the leading companies, especially those in the tech sector, have embraced agile principles. Phone giant O2 recently designed its new 200,000 sq ft office in Slough to reflect its agile working culture and opened the offices by initiating a trial day for flexible working. The trial was deemed successful and the firm found that over half its workers spent commuting time working instead. The firm was able to reduce the number of desks at head office by 550 despite having the same number of staff. Apparently this freedom has resulted in 48% of staff feeling less stressed. 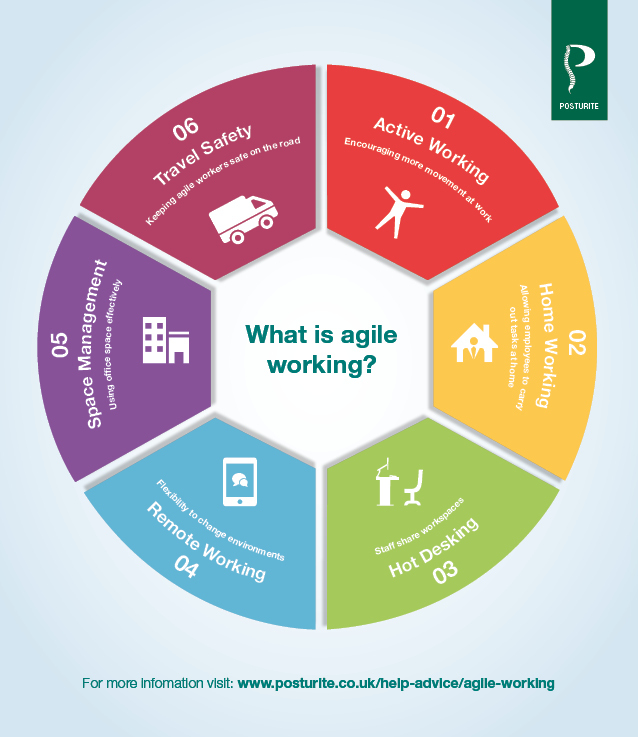 While agile working clearly has far-ranging benefits, it doesn't come without its risks. Particularly in relation to the equipment we use to do our work. Desktop computers are gradually being replaced by mobile technology such as laptops, tablets and smartphones. The BPS World study found that 10% of senior decision makers consider the office to be an outdated concept. While they do unshackle us from our desks, mobile devices still pose major risks when it comes to ergonomics. As we all know, musculoskeletal disorders (MSDs) cost businesses millions each year so it's vital that we factor ergonomics into our agile working strategies. While we're still governed by display screen equipment (DSE) regulations that haven't been updated since 1992, it is possible to take matters into our own hands. At Posturite we've been carrying out consultations and assessments for businesses since the early '90s, so we've witnessed this fascinating shift towards agile thinking first-hand. Over the years we've adapted our product and service offering to make sure we're equipped to support agile businesses. If you're not sure where to start with improving the health and wellbeing of your agile staff, a consultation is a good place to start. We can assess individuals and environments to work out the best holistic solution for you and your budget. Our flagship online DSE assessment AssessRite 3.0 has been upgraded to include a module on mobile technology. This trains users to use their portable devices (laptops, tablets and phones) in safe, comfortable ways to reduce the risk of MSDs. AssessRite for Homeworkers offers advice tailored for the home environment. From laptop stands to sit-stand desks, we're passionate about designing, sourcing and supplying products for agile workers.